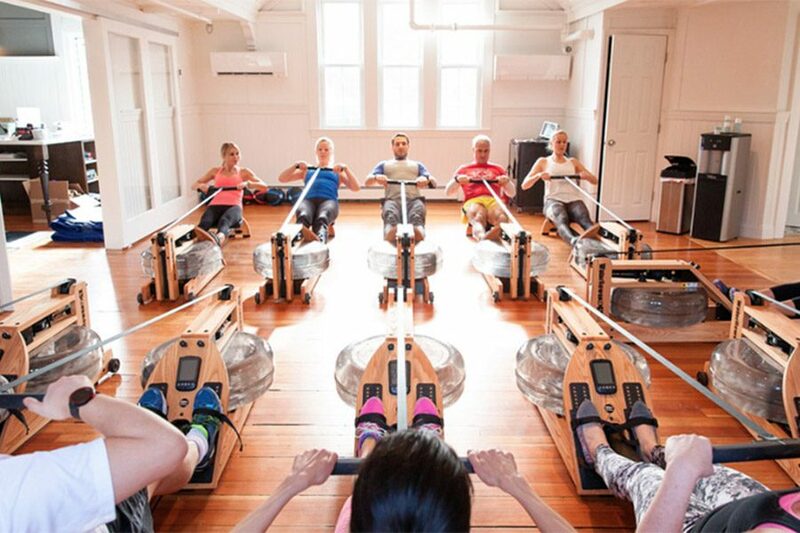 Will rowing become the new spinning? The next big question in fitness remains: Will we start seeing indoor rowing studios pop up on every corner just the same as spin studios did a few years back? Right now, it seems the answer is a resounding yes—especially from indoor rowing studio owners Elise Caira, of Sweat Fixx, and Joey Tagliente, of Row Republic, who both have dreams of becoming the equivalent of the next Soul Cycle or Barry’s Bootcamp. And their dreams aren’t too far off. The rowing trend is hitting hard right now. On top of studios popping up left and right, you can also row with local on-demand rowing classes from a mobile app called Regatta Fitness and Hydrow, a Boston-based company, that created a rower very similar to a Peloton bike. The sport truly is everywhere—and not just for those who want to try it on the Charles River. Classes at this new North End studio, with plans to open in early spring, will combine intervals on the rowing machine with intervals of strength training for a workout much like Barry’s—they’re just replacing the treadmills for fancy Italian-made rowers. Drop-in classes are TBD, 77 N Washington St., Boston, row-republic.com. With locations in Wakefield, Arlington, and South Boston, Sweat Fixx is utilizing custom-made water rowers in four different classes. Pairing rowing intervals with things like high-intensity exercises, strength training, and yoga you’ll be able to choose a class based on what you need for the day. Drop-in classes are $21, Multiple locations, sweatfixx.com. This studio is much like a spin studio such that the instructor will be at the front of the room rowing along with you as they lead you through rowing intervals to high-energy music. Coming to Lovejoy Wharf in the early summer, you’ll be able to row with a view of the water. First class free, 25 Lovejoy Wharf, Boston, 857-702-2769, therowhouse.com. Burn offers several types of rowing classes, all of which take place on Water Rowers: rowing machines equipped with a WaterFly wheel filled with actual liquid, meant to mimic the resistance real rowers fight against on the river. Drop-in classes are $25, 547 Columbus Ave., burnfitboston.com. Btone, which has locations in Boston, Wellesley, Lexington, Waltham, and soon-to-be in Hanover and Middleton also runs Indo-Row classes, simulating the race atmosphere of competitive rowing on Water Rowers with endurance rowing classes and circuit-style. Drop-in classes are $30, multiple locations, btonefitness.com. Though it’s only open to Equinox members, the gym’s Shockwave class incorporates short bursts of high-intensity rowing into a traditional bootcamp format. Memberships are about $150 a month, multiple locations, equinox.com. Orangetheory’s signature interval training class mixes treadmill and strength drills with indoor rowing for a multi-faceted, full-body workout. Drop-in classes are $25, 375 Market St., Brighton, orangetheoryfitness.com. Using principles from CrossFit and bootcamp, Renegade Rowing’s classes blend functional, interval, and strength training to get you working hard. 110 Holton St., Brighton, renegaderowing.com. Started by rowers, for rowers, this Brookline space allows for full development of form on the erg as well as classees geared towarsds your core and total-body strength. If you’re not into classes you can head into the studio for open row in a room outfitted with flat screen televisions and surround sound. 62 Harvard St., Unit B, Brookline Village, 617-505-3168, powerrowing.com.